Ch-ch-ch-changes, turn and face the strange. David Bowie wrote those words in 1971. Almost 45 years later, this song is stuck in my head as I read that Apple may be partnering with Microsoft later this year, attempting to take on Google in the world of search engine marketing. How strange it would be to see that partnership. But oddities aside, what exactly does this mean for your business and your online marketing? First, let’s clarify exactly what I’m referring to with this partnership. 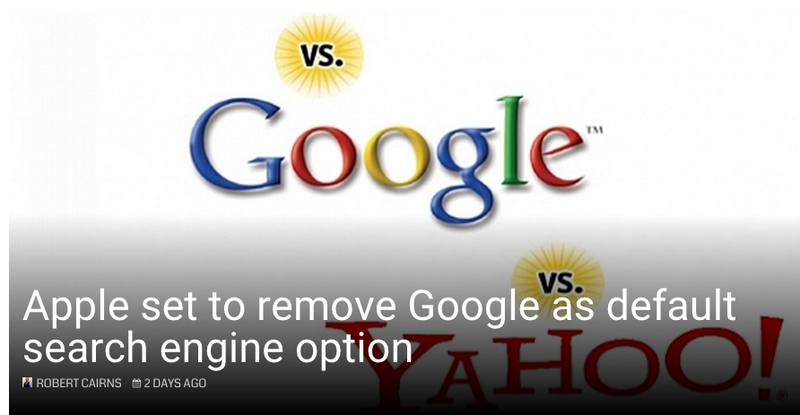 As stated in this article, Apple is preparing to remove Google as its default search engine, with possibly Bing or Yahoo (both Microsoft companies) replacing the search engine giant. And while this may not hurt Google’s search engine market dominance in reference to the desktops, it will be a significant blow to them from a mobile perspective. As stated in the above article, they could stand to lose up to 45% of the mobile search market overnight. It’s too soon to tell how this is going to play out, but for the sake of your business and your online marketing, I recommend keeping a close eye on it. It may be time to seriously consider including Bing and Yahoo in your online strategies. Particularly when you consider that mobile usage will surpass desktop usage online within the next two years. And while the iPhone is not currently the market leader, it is the fastest growing piece of the puzzle. Tis strange days indeed.